We finally got a bit of rain last night. Now stuff will probably really start popping up with these warm temps. I don't know how this can last. My image today is a bit different one. I am not fond of Wasps at all because I have been stung by them. However this guy was just intent on drinking from the Sedum and didn't seem to care about me at all so I was able to get this shot. 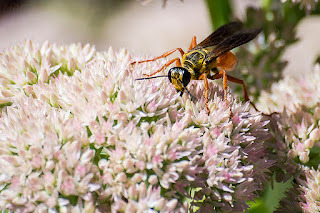 I am not sure what type of wasp it is, I couldn't find a color match in my book. I thought it was kind of a colorful one though.